PRINCETON, N.J., Aug. 20, 2018 /PRNewswire/ -- ST Robotics announces that it is has built an interface between its RoboForth natural language system and ROS (Robot Operating System), adding even more flexibility to ST's proven industrial robots. Making the ST Robots compatible with ROS has resulted in a very fast interface with the ST robot responding faster than any other robot that is currently compatible with ROS. One user at Waterloo University in Canada writes: "RoboForth is so lean and the performance on Linux is insanely good. There aren't any other industrial grade robots that have this kind of performance." ST has been collaborating with Cambridge University on the ROS integration. They have been modeling the ST R12 robot to create data files called URDF (Universal Robotic Description Format) files. Motion is then programmed using MoveIt!, a part of the ROS module that enables the user to send joint angles to any robot in the system, and the motion can be graphically viewed with rviz (ROS visualization). The code for the ROS/RoboForth interface is available for free on the development platform GitHub. "We're thrilled to add ROS to the ST Robotics' toolbox and to be a part of the increasing innovations and research being done with ROS," commented David Sands, President and CEO of ST Robotics. "An ST robot can now be integrated into a system comprised of other robots in which all the robots conform to the same commands and rules via one interface." A recent report published by Transparency Market Research titled, "Global Robot Operating System Market Trends, Applications, Analysis, Growth, and Forecast: 2017 to 2026," forecasted the global ROS market to reach US$ 402.7 million by 2026, reflecting a CAGR (compound annual growth rate) of 8.8%. ST Robotics, widely known for 'robotics within reach', has offices in Princeton, New Jersey and Cambridge, England, as well as in Asia. 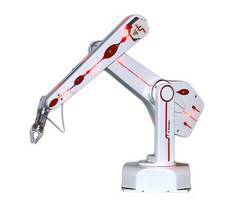 One of the first manufacturers of bench-top robotic arms, ST Robotics has been providing the lowest-priced, easy-to-program boxed robots across industries for the past 30 years. ST's robots are utilized the world over by companies and institutions such as Lockheed-Martin, Motorola, Honeywell, MIT, NASA, Pfizer, Sony and NXP. The numerous applications for ST's robots benefit the manufacturing, nuclear, pharmaceutical, laboratory and semiconductor industries.